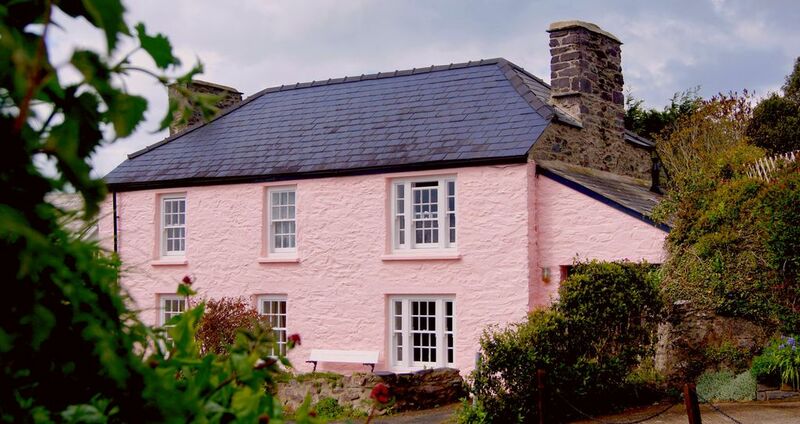 Cottage in St. Davids, Pembrokeshire, Wales - Located on Quickwell Hill, near the Centre of St Davids, Shops, Cathedral. Located on Quickwell Hill, near the centre of St Davids, close to shops and cathedral and 10 minutes walk from the sea. Sleeps five in three bedrooms, and has a double sofa bed. My neice Kate and I inherited the cottage in 2009 from our cousin, Nancy Bayly nee Howells, a well-known and much-loved figure in the area. The cathedral flag flew at half-mast for Nancy's funeral and the Lifeboat Association provided a guard of honour. Our family lived in and around St Davids for centuries but have now all moved away. I live in central London. Carol and I couldn't bear to sell Ty Nancy - we'd had so many wonderful holidays with Nancy when we were children. But we couldn't afford to keep it either. So we decided to see if we could rent it for holidays and will come down ourselves in the gaps! Nancy would be very pleased with this idea. She'd love to welcome you to the cottage and and would want you and us to have a wonderful time. Many people remember Ty Nancy from visits to St Davids. They think of it as 'the pink cottage,' overlooking the cathedral. When we were children, staying in the pink cottage, Nancy would show us how to tell a buzzard from a peregrine falcon, and where the badgers and foxes ran at night. She kept bees, and knew a huge amount about their lives and activities. We had the best ever holidays in St Davids, and still visited when we could during our adult lives. On the right of the driveway is the ancient 'cowled' spring of Quickwell, once an important source of water for all St Davids. Some people think the 'cowl' round the door is there because the spring was used by the abbey. Nowadays it is kept firmly locked shut. St Davids is well-known as the smallest cathedral city in the UK. It's little larger than a village, but there are plenty of food shops and restaurants covering all price ranges. The good thing about St Davids is that not only is it an area of stunning beauty, with the coastal path in particular within easy walking distance, but also it's got plenty of things to do other than walking. The cathedral and Bishop's Palace are amazing, and there are lots of amusements for children and adults. Also, the people are incredibly kind. We'll forever be grateful to the Bennett family - who restored the cottage for us in 2010/11 - for all the 'extras' they did for us like helping find people to do the changeovers, and rushing down to accept parcels from the postman! toilet, Main floor toilet and basin. toilet, combination tub/shower, 1st floor bathroom next to bedrooms. There is a telephone for in-coming calls only. Large sitting room, containing modern and antique easy chairs and antique wooden furniture. It has an open, wood-burning fire, television and DVD player, and opens through an arch onto the dining room, with chairs, dining room table and side tables. The large kitchen has been completely modernised and has an electric cooker, microwave, fridge-freezer and dishwasher. The original walk-in larder and overhead wooden drying rails have been retained. There is a wooden table and benches. A small secluded “secret” garden (complete with ancient 'cowled' spring!). St Davids City Golf Club, Whitesand Bay, Saint Davids, SA62 6PT is in easy walking distance. Notes on accommodation: There is full central heating with radiators in every room, and a wood-burning fire in the sitting room. Gas, electricity and WI-FI connection are included. There is a telephone for in-coming calls. While we do permit dogs at the cottage (for a surcharge of £20 per dog), we kindly ask that they be kept only in the downstairs portions of the house (not on the furniture) and outside, of course. For hygiene reasons dogs are not allowed in the sleeping rooms. Outside: There is a small secluded garden with a table and stone benches. Utility Room: Washing machine, tumble dryer, basin, iron Cleaning / Towels / Linen / Maid service: The property is cleaned weekly and towels and linen are changed then. Bedding and one towel per person is provided, additional towels have an extra charge of £5 per towel. I was lucky enough to have chosen a lovely sunny week in September for my visit and Ty Nancy was the perfect location. Loved being able to leave the car and walk - especially enjoyed the walk to St Non's Chapel & lots of coffee and cakes in the local cafes! Contact with the owner Kate was excellent and Toby the Westie and I would highly recommend this property! Really comfy home from home. We had a great week staying at Ty Nancy, AKA The Pink House. It's beautiful on the outside and the inside, ideally located a two-minute walk from the center of St Davids with its restaurants, shops, great ice cream, and the world's most beautiful cathedral. It's also very close to the town's supermarket and closer still to Safron, an exceptional Indian restaurant. The house is equipped with everything to make one's stay comfortable. What makes Ty Nancy so special, though, is its hominess. Nancy's benign spirit seems to be looking over the house and making sure that everyone is happy there. We hope to return for next year's St Davids Festival, an annual event that shows off what is best about this, the UK's smallest city. Ideally located, a few minutes walk from both town centre and open country. A good, central base for walking. The cottage is well-equipecd and comfortable. Lovely secluded garden. The Pembrokeshire Coastal Path is 10-15 minutes walk away. Whitesands Bay (which holds a European Blue Flag Award) is about 20 minutes walk away. There are many other beaches within easy reach. Use of a car is recommended, though there are buses going around the coast. The nearest railway station is Haverfordwest. There are buses from the station to St David's. St Davids is a designated conservation area with a cathedral and the ruins of a once magnificent medieval Bishop's Palace. The cathedral has excellent choirs, and is a centre for concerts by many visiting musicians. There are many restaurants offering meals from takeaway fish and chips to haute cuisine, as well as supermarkets, banks etc. Boat trips can be taken to several offshore islands, including some with particular interest to bird lovers, like Skomer Island. There are numerous amusements for both children and adults, many of which vary through the year. The Tourist Information Centre, with full details, is five minutes away. It houses an art gallery with paintings by Graham Sutherland, who lived locally. Booking Notes: Please be aware that we only can take bank transfer payments and no Credit Cards or we would have to charge extra! The standard rate includes 5 guests. Should the sofa-bed in the living-room b e required (for 1-2 additional guests), there is an additional charge of £50 per week. We ask for a further deposit of £100 against damages, which will be refunded 10 days after departure. Change over Day: Change-over day is Saturday. The cottage is cleaned in the middle of the day, so please arrive after 5pm and leave before 12am.